This article first appeared in The Edge Malaysia Weekly, on April 10, 2017 - April 16, 2017. DESPITE a call by Deputy Health Minister Dr Hilmi Yahaya to raise cigarette prices to RM21.50 per pack from the current RM17 last month, the government has no immediate plans to hike duty on tobacco products. Instead, the focus will be on cracking down on the illicit cigarette trade, which accounted for a staggering 57.1% market share as at last December. 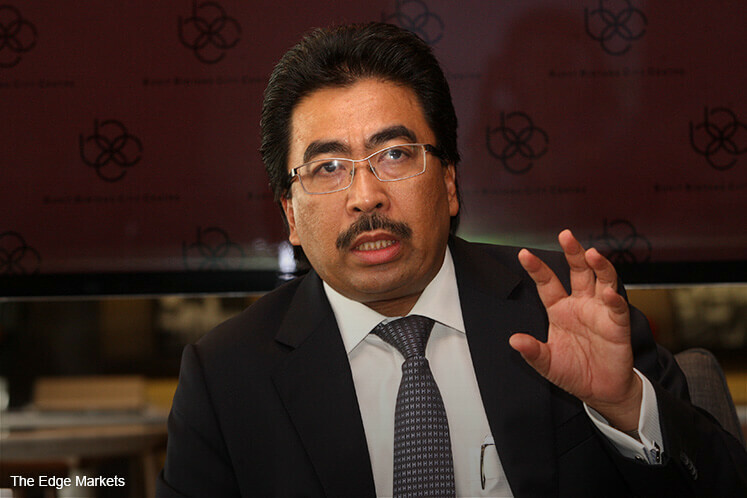 “At the moment, the government has no intention of increasing the cigarette tax,” Second Finance Minister Datuk Seri Johari Abdul Ghani tells The Edge. Legal tobacco players are lauding the government for improving clarity on the matter and turning its attention to the real problem — the smuggling of cigarettes. An immediate beneficiary of the news should be British American Tobacco (M) Bhd (BAT). The group saw its share price fall 5.1% to RM45.44 following Dr Hilmi’s statement on March 29. Since then, BAT’s share price has recovered mildly to close at RM46 last Friday. The other tobacco majors, JT International (JTI Malaysia) and Philip Morris, are not listed. That said, unless the tide of illicit cigarettes can be turned back, BAT’s earnings are likely to continue to face downward pressure. Illicit cigarettes used to make up about a third of total cigarette consumption. 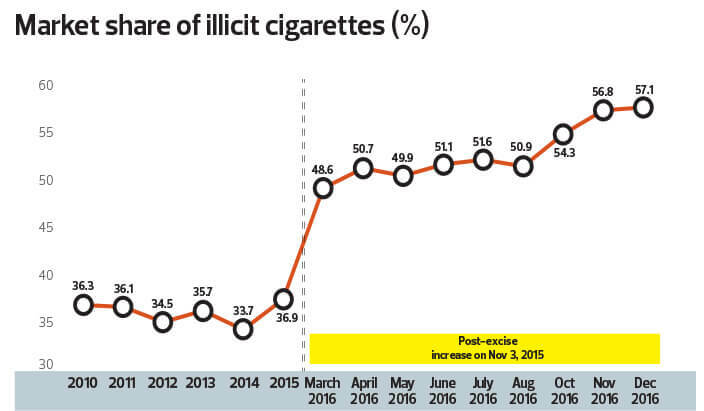 But the 40% increase in excise duty in November 2015 became a catalyst to drive demand for illicit cigarettes. It is estimated that a 20-stick pack of illicit cigarettes costs only between RM3 and RM5, compared with RM17 for legal cigarettes. It is estimated that the illicit cigarette trade is worth between RM2 billion and RM3 billion a year and costs the government over RM4 billion in lost tax revenue. Likewise, legal players, like BAT, are feeling the pinch. Last year, BAT reported that the legal domestic market registered a volume contraction of 25.7% year on year. In turn, this led to a 29.6% y-o-y decline in BAT’s operational profit to RM321 million, adjusting for the group’s restructuring exercise. BAT has the largest share of the legal cigarette market, at 57%. Looking ahead, it remains to be seen if the government will be able to successfully clamp down on illicit cigarettes. After all, the sheer volume of illicit cigarettes making its way to Malaysian smokers — over 12 billion sticks a year — points to a relatively well-funded and organised operation. Nonetheless, the tobacco industry is optimistic. “Can we turn back the tide of illegal cigarette trade? Yes, but it will require the government to look into the matter holistically,” JTI Malaysia managing director Guilherme Silva tells The Edge. Realistically, the government may not have much choice. As long as there are massive volumes of illicit cigarettes in the market, the government will find it difficult to achieve its healthcare and tax revenue targets. The abundance of cheap illicit cigarettes does little to dissuade Malaysians from smoking. It also undermines the effectiveness of increasing the prices of legal cigarettes. In addition, it makes other anti-smoking initiatives ineffectual, for example, Dr Hilmi’s proposal to raise the legal age of smoking from 18 years old to 21. With easy access to illicit cigarettes, such age restrictions will be difficult, if not futile, to enforce. “At 57.1% of market share, illegal cigarettes are a national issue and a no-win situation for all parties — the Ministry of Health on its commitment to reduce consumption, the Ministry of Finance on its tax collection and the legitimate tobacco industry on its sustainability,” says Silva.